A few thoughts....: Will HDBaseT Replace HDMI in Healthcare? Will HDBaseT Replace HDMI in Healthcare? HDBaseT is poised to replace HDMI as the new A/V/control standard in clinics, hospitals and other healthcare environments. HDBaseT technology runs over standard Cat5e/6 cable and implements something it calls 5Play, a feature-set that converges full uncompressed HD video, audio, 100BaseT Ethernet, and various control signals. Perhaps the most compelling difference is that it transmits up to 100W of power - enough to drive a 37-inch TV. The inclusion of power within the feature set is particularly applicable to the healthcare market where installers are often burdened by the requirement for proximity to an outlet. Another benefit is that it can extend up to 100 meters passively. HDBaseT has the bandwidth to support the highest video resolutions such as full HD 1080p as well as 3D and 2Kx4K formats. It is promising to be the first to provide all-in-one connectivity, making it possible for a single-connector TV to receive power, video/audio, internet, and control signals from the same cable. 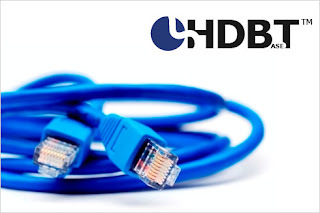 Without jumping into too much of a technical discussion, HDBaseT is able to send much more information than HDMI over a set of 8 wires within a standard Cat5e or Cat6 cable because it uses much lower frequency modulated packets. These are not IP packets like you find in Ethernet and are not subjected to typical electromagnetic interference. Thus, the cables can run alongside medical devices and other infrastructure and not suffer signal degradation. 5Play – The future of networking in healthcare? HDBaseT's protocol allows you to network your displays and other sources, similar to a home data network. The HDBaseT Alliance organization calls this 5Play and they demonstrated healthcare specific applications at the HIMSS (Healthcare Information & Management Systems) conference in February. Future capabilities include diagnostic and testing machines, creating a new method of testing patients where the technician doesn't have to be in the same room. This could be a breakthrough in healthcare and increase the efficiency and safety of medical professionals. HDBaseT healthcare use cases could include display installations in patient rooms, lobbies, triage, waiting areas and more. HDBaseT can also link medical imaging devices such as CT and X-ray scanners to remote monitors, reducing technicians’ exposure to radiation. The AV industry has become weary of new standards, many of them never hitting the market. HDBaseT took special precautions by founding the group with heavyweights like LG, Samsung, Valens Semiconductor and Sony Pictures and waited to announce and promote the new standard until after the HDBaseT 1.0 specification was finished. Work is already underway on 2.0, but 1.0 is announced and available with products supporting it out of the gate. HDBaseT does bring a true standard - a unified and simplified protocol - to the market, not just a new cable. Today, there is a growing abundance of content in the healthcare facility, including video, images and data. As HDTVs and other devices proliferate throughout the industry, the amount of content, and the ability to move it around the facility, becomes more complicated for integrators. The next stage in networking is the ability to control and distribute this content securely and be able to manage it effectively. HDBaseT does have some weaknesses and needs to planned and managed carefully. Since HDBaseT is IP-based and carries a lot of data intensive information, it can easily overrun network traffic. It is important to isolate the data stream from the video stream which may mean running a local network for AV signals with a bridge to a data network for control and management. Expect commercial level products to come to market that have separate ports for signal transport and data/control transport. Length of cable is still important for image quality and some legacy clinics and hospitals have challenging cabling environments. Given the pros and cons, HDBaseT technology is well-positioned to offer a simple solution to meet the healthcare industry’s growing needs and will likely be an important consideration in the years to come.